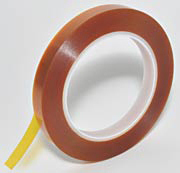 This single sided tape consists of a Kapton® polyimide film with a silicone adhesive, compatible with a wide temperature range. Kapton® tape with silicone adhesive exhibits better adhesion to "difficult surfaces", but at the same time the high adhesive film bond greatly reduces adhesive transfer to leave a cleaner surface. This tape can be used in harsh environments and has a specified temperature use range is -75° to +260°C (-100° to +500°F). However, successful applications have been reported in the temperature range of -196° to +400°C (-321° to +752°F). Kapton® film thickness is 1.0mil (0.03mm), total tape thickness with adhesive is 2.7 mil (0.07mm). Standard 76mm (3") plastic core. Applications are as diverse as tape for elevated temperatures, masking for protection of contacts on printed circuit boards during wave solder or dip solder process, masking during vacuum deposition and positioning tape for cryo applications. Relatively low outgassing in vacuum. This single sided Kapton® tape consists of a thin Kapton® film with a silicone adhesive on one side of the Kapton® polyimide film. Designed to use in harsh environments and offer high performance, high reliability and durability. 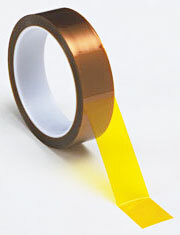 The Kapton tape has a high dielectric strength. Silicon adhesive protection does not leave a residue. Can withstand temperatures up to 260°C/500°F. Kapton® film thickness is 1 mil (0.03mm), silicon adhesive is 1.5 mil (0.04mm) thick which give a total thickness of 2.5 mil (0.07mm). Length is 32.9m (36 yards). Standard 76mm (3") plastic core. 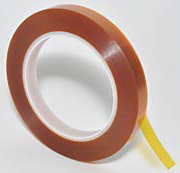 This low static single sided Kapton® tape consists of a thin Kapton® film with a silicone adhesive with ESD additive to reduce the static charge. Designed to use in harsh environments and offer high performance, high reliability and durability. The Kapton tape has a high dielectric strength. Silicon adhesive protection does not leave a residue. Can withstand temperatures up to 260°C/500°F. Kapton® film thickness is 1 mil (0.03mm), silicon adhesive is 1.6 mil (0.04mm) thick which give a total thickness of 2.6 mil (0.07mm). Length is 32.9m (36 yards). Standard 76mm (3") plastic core. This double sided Kapton® tape consists of a thin Kapton® film with a silicone adhesive on both sides of the Kapton® polyimide film. This product is designed to bond on silicon substrates and can be used in harsh environments with temperatures up to 260°C / 500°F. Removes cleanly from smooth surfaces with minimal chance of adhesive transfer. Kapton® film thickness is 1.0mil (0.03mm), total tape thickness with adhesives is 4 mil (0.10mm) with 1.5 mil (0.04mm) adhesive on each side. Standard 76mm (3") plastic core. Used for a wide variety of applications such as secure masking and/or sample in vacuum systems. Relatively low outgassing, cryo compatible. Low Static Polyimide Film Single Sided Tape, with or witout liner versions, 2.7 mil (0.07 mm), polyimide-film backed silicone adhesive tape with unique and extremely good electrostatic discharge properties. Liner version has an easy release layer that covers the silicone adhesive surface to provide capability to produce die cut parts or position tape prior to exposing adhesive. Comparable with Kapton® Tape. Temperature range 73° to 260°C (100° to 500°F). Translucent gold-amber. Standard 76mm (3") core. Thickness 2.7 mil (0.07mm). This tape is clear and has an adhesive thickness of 2.0mil (0.002") (50µm). The double sided acrylic adhesive (high tack) also has a 4.0mil (100µm) 60lb densified kraft paper liner. The adhesive film on the paper liner transfers to most surfaces on contact. Remove the liner and the adhesive remains in place. Used for mounting or attaching. 76mm (3") core. Medium adhesive strength on both sides: 27.7g/mm (25oz/in). Available as 1/2" x 60 yards and 3/4" x 36 yards in length. This single sided tape can be used for many long-term weather resistant and protecting requirements. It is a white Tedlar® PVD with acrylic adhesive. Good aging properties because it contains no plasticizers. It remains tough and flexible over a broad temperature range. The properties of Tedlar® film include excellent resistance to weathering, outstanding mechanical properties and inertness toward a wide variety of chemicals, solvents, and staining agents. Tedlar® film tape is strong, flexible, and fatigue resistant. Can be certified to meet Mil Spec MIL-T-22085, Amendment 3, Type IV. Further typical physical properties are listed on 3M Technical Sheet. The 9415PC repositionable tape is coated with a strong acrylic adhesive on one side and a weak acrylic adhesive on the other side. Ideal for application where one side remains in position, but the other side needs repositioning, easy unloading or easy removal. Can be used for holding samples during processing and allow for easy and clean removal after wards. This tape has a translucent polyester carrier with a liner of white polycoated kraft. It is a relatively thin tape with a thickness of 50µm (0.002"). Good UV resistance and moderate solvent resistance. Nonconductive. Standard 76mm (3") core. Available in 19mm (3/4") width. Adhesive strength on backside (under liner): 5.5g/mm (5oz/in). Single sided silver polyester tape is used for making ultramicrotome boats, and for other applications. The tape is 1.0mil (0.025mm) thick. Silver appearance due to aluminum coating on the polyester film. Acrylic adhesive is used. Standard 76mm (3") plastic core. 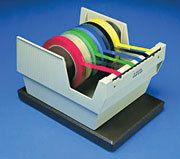 Holds multiple tape rolls with a 76mm (3") inside diameter core; up to 15.2cm (6") total width. The special weight holds the dispenser steady during pulling/cutting. Maximum roll outside diameter 17.5cm (6-7/8"). This is the original matte finish invisible tape. It is the preferred tape for office, laboratory-office, industrial-office, shop-office, schools and home use. It disappears on paper and will not show on copies. Pulls off the roll smoothly and easily. Resists splitting and tearing. Easy to handle and apply; resists yellowing and drying out. 1"/25.4mm core size. Pure, unsintered, contains no adhesive. Seals small crevices, conforming to surface irregularities, threads, joints. Use for ground glass joints, desiccators, freeze drying equipment and sealing threaded pipe joints up to 1-1/2" (38mm). Facilitates later joint removal. 0.08mm thick. Grade: MiL-T-27730A. 3M 1280 has a red color, 3.6 mil (0.091mm) total thickness and is a polyester film tape with silicone and rubber blend adhesive. 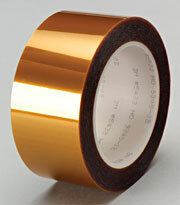 This tape is used for printed circuit board masking during electroplating. It is a low stretch polyester film for machine as well as hand application. Elongation (break or yield) is 125%. Backing thickness is 0.9mil (0.02mm). The polyester backing reduces stretch and recovery of tape and associated uneven “stop-off” line. 3"/76.2mm core size. A thick adhesive coating reduces undercutting because adhesive helps block out solutions between fingers. Mask many printed wiring boards during solder stripping and precious metal plating of fingers. 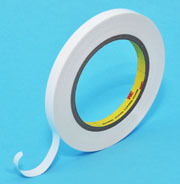 This tape can be used for splicing silicone treated papers. This tape generally performs better when no ovens are used to heat tape and boards. Withstands temperatures from 40° to 170°F (4° to 77°C).